I’m very pleased to offer two half-length folk portraits by the very well-collected American artist Jacob Maentel. While we mostly think of Maentel as a Pennsylvania artist, he did paint many of his wonderful folk portraits in Indiana, where he moved his family in 1836 and lived until his death in 1863. In addition to his highly detailed, small watercolor portraits, Maentel painted landscape-decorated firescreens. Most of the Maentel likenesses that have been uncovered are full-length, some with elaborate backgrounds of interiors, some with less elaborate exterior backgrounds. It is unusual to find a half-length portrait by him. Like bust-length silhouettes by Edouart, the half-length portraits are quite desirable but, also like the bust-length Edouarts, they are more affordable than the full-length portraits. Because of the concentration on the upper body and face, half-length portraits, such as the two that I am offering in separate listings concentrate Maentel’s wonderful details on the faces, hairstyles, clothing and jewelry. This likeness is of another young lady, perhaps sister to the other listed Maentel, but, while certainly stylish in her dress and appearance, perhaps not as flamboyant as the first. This lady wears her hair in a large knot that hugs the crown of her head and is held in place with a large haircomb. She wears two ringlet curls on each side of her forehead. As with her “sister”, Maentel wonderfully depicted individual strands of this girl’s hair. Her facial features are carefully depicted with a strong skin tone, well-done shading and individual strands of hair painted for eyebrow and eye lashes. She wears a large gold hoop earring which the artist outlined to add dimension. This lady wears a low cut empire waist blue dress with short puffed sleeves. She also wears a white netting tucker which is topped with a small downturned self-fabric collar. We cannot see whether the white lace netting on her arms is part of a full length glove or a separate lace sleeve—but it would be a hit in today’s fashion world, don’t you think? The lace netting is wonderfully accomplished with individual brush strokes of varying widths and pressure which really gives the viewer the feel of netting lace (like the old fishnet stockings we used to wear in the 1960s!). Both Maentel profiles that I am listing today are from the Clarence and Mildred Long Collection of Indiana Artists. The Longs were life-long residents of Indiana who were well known for the charitable work and dedication to promoting Indiana’s history and culture. They amassed a large and enviable collection of great art by Indiana artists. They were important to the art culture of Indianapolis. Clarence was a member of the Indiana University Board of Trustees and very influential in establishing an art museum on the university campus. Mildred was a long-time volunteer and docent at Indianapolis Art Museum and served as a member of the Indiana State Arts Commission. The contributed much time and money to the addition of Indiana art in the museums of Indiana. Clarence died in 2009 and Mildred in 2013. The fact that these two Maentels were in their collection at their passing is testament to the importance of Maentel’s work. 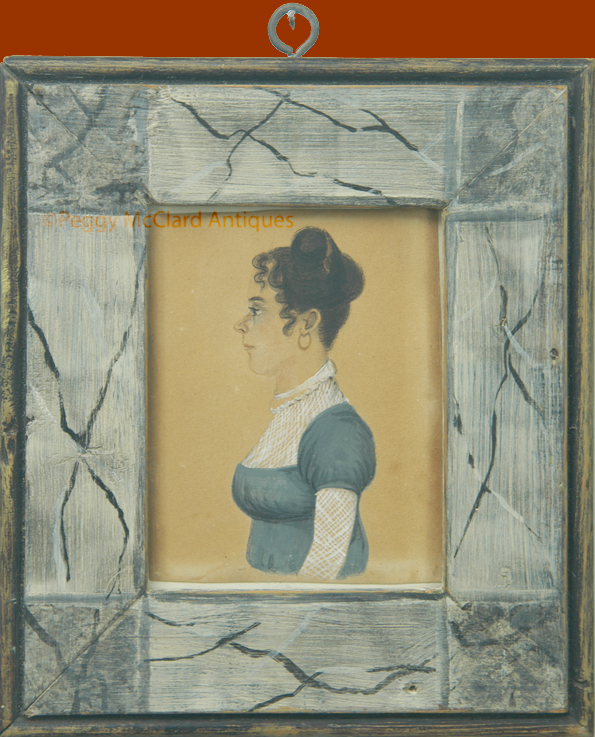 This profile is housed in a lovely, very well-done, reproduction paint decorated frame of grey & blue with painted corner blocks and faux marbling. The frame, while not period, provides the perfect period look for this lovely folk painting and really brings the blues and dark colors used for hair and facial modeling to the forefront of the composition. The paper has overall toning of a moderately heavy nature. There are a few slightly darker stains throughout, but you have to examine the painting well to find them. The right and bottom margins of the paper are slightly lighter, showing where the rabbet of the first frame protected the paper somewhat from UV rays. Today, she is floated on conservation ragboard which is eggshell colored and shows just a little in the margins of the frame opening. 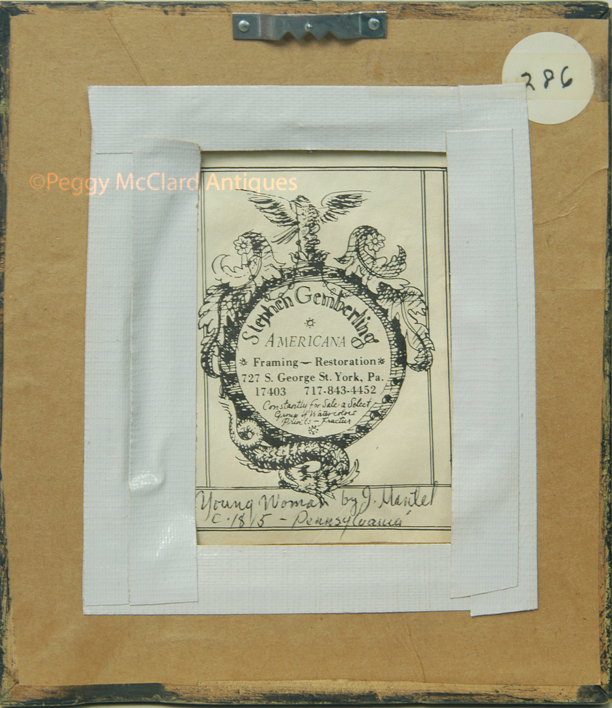 The reverse of the frame has a trade label for “Stephen Gemberling / Americana / Framing – Restoration” with a York, Pennsylvania address. 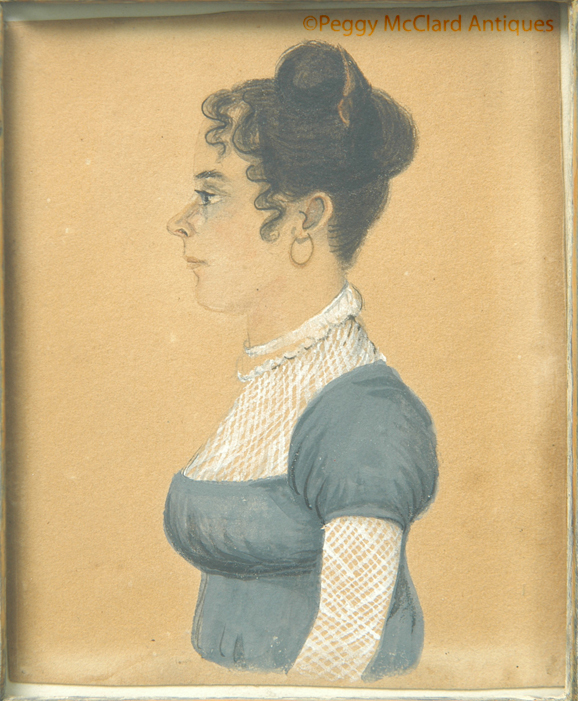 On the lower part of the label is an inscription saying “Young Woman by J. Mantel c. 1815 - Pennsylvania”. (Interestingly, the inscriptions on both labels spell differently than the most used spelling but each spells it differently even though obviously written by the same hand.) 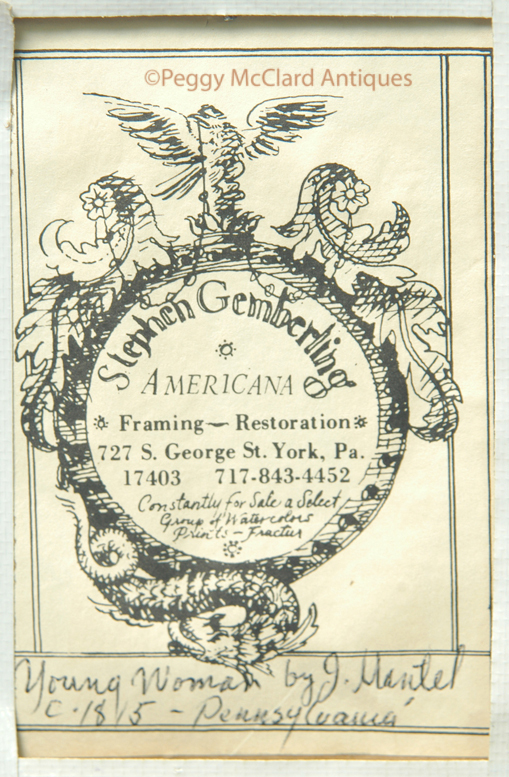 I really haven’t found much about Mr. Gemberling except a 1977 advertisement in The Clarion (the Folk Art Museum’s magazine) giving an New York City address. The provenance given for these two paintings are that the Longs privately purchased them in 1977. Framed size 7 ½” x 6 ½”. Sight size 4 ¼” x 3 ¼”. Circa 1815-1820. This is a fabulous piece of American folk art from an important collection. Make sure you check out the other Maentel being listed. Please see the Folk Portrait Artists page for more information about Jacob Maentel .